I've begun using a software VPN utility called Hamachi, owned by the guys at logmein (every family IT dude's friend). Alas, there is a slick Windows client, but the OSX one is pure command line. I'm totally fine with that, but I figure "let's see if I can make it all OSeXy". 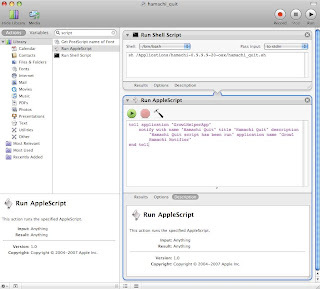 So I created a bash script to execute all the Hamachi commands, and I combined that with some Applescript and OSX's Automator, which is kind of a wysiwig script editor. I could have done it all in bash or Applescript, but I wanted to put my script on the dock and run it from there. Only Automator "executables" can be moved directly to the dock. Here's a sample from my automator window. Note how cool it looks to have a wysiwig script editor! So the end result is I have a clickable "thing" on my dock which will start up or quit the OSX Hamachi client. I also added in a Growl notification for fun, which is shown below.